Mark's Marabou Tube Flies have gained popularity for several kinds of anadromous game fish. Recently this type of fly has become extremely popular for both winter and summer steelhead. Originally designed so that a smaller hook could be used with a large fly to cut injury to wild steelhead, this configuration also proved itself as a way to land a higher percentage of fish that were hooked. These flies are very streamlined and easy to cast. Plastic tube models are very lightweight which gives them lots of action when they are submerged. These lightweight flies are tied on Pro Sportfisher Flexitubes. which fish comparatively snag free. The best way to fish these flies is with a sinking tip line. They are cast across current and allowed to swing deep under tension. Each fly is supplied with a size 4 hook. To tie the fly onto the end of your leader, simply pull the hook from the rear of the plastic tube, pass your leader through the fly from the front through the back, and tie the hook to your leader and re-insert the hook into the tube. If the hook becomes damaged it can be easily replaced without disposing of the fly. Many other hooks fit these flies as well. It is wise to purchase and carry spare hooks. Every angler goes through an evolution. I have fly fished since early childhood. My first dozen winter steelhead were caught with flies on a fly rod. My first successful winter steelhead flies were all bright colored. Then I met an angler while he was landing a dandy fish on one of George Cook's Blue Moon flies. That changed my mind set. Blue Moons got me out of the bright fly mode for certain parts of the season. This is still my go-to color for dark days, especially when fishing glacial fed rivers. I found that tying these flies on tubes gave me the ability to replace damaged hooks easier, and to use smaller hooks so there wasn't as much trauma to fish that were released. These flies got even more productive when Rainbow color flashabou was added. There is no surprise that the next Marabou Spey Intruder type of fly that became extremely popular was tied with red over orange marabou with gold Flashabou added. This is the best color combination for moving dour fish when the bright sun is shining on them. I guess it is like waving a red flag in front of a bull. 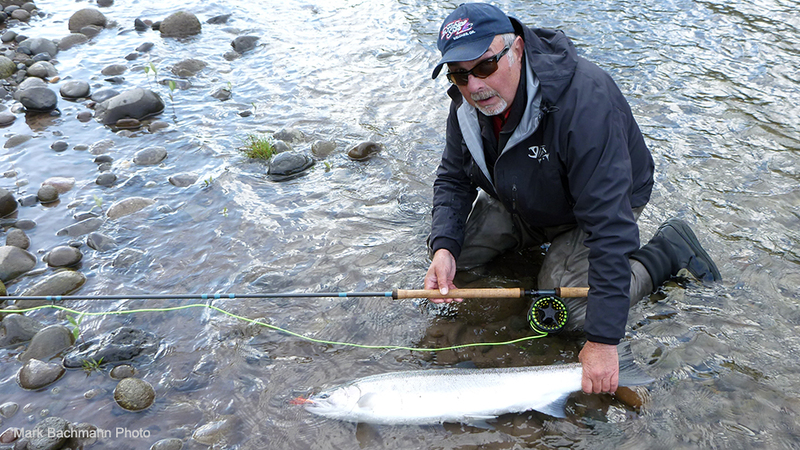 This fly has caught steelhead from many different rivers at many different times of the year, and for many different anglers in the last 30-years. That is one heck of a track record. 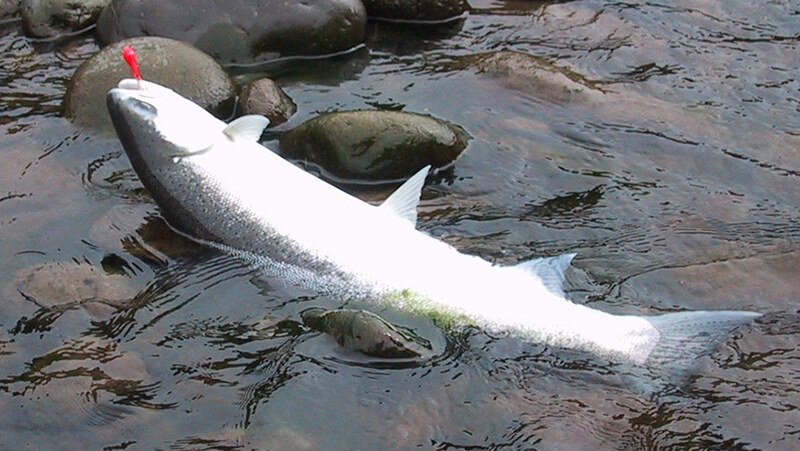 It is also popular on some Atlantic salmon rivers. It is an extremely simple tie: red marabou over hot orange marabou, with gold Flashabou, all on a red Flexitube. This is the fly for the early winter. There are many pinkish-orange shrimps off the Oregon coast from November through February, and pods of steelhead come through through these schools of shrimp while returning to their native rivers. 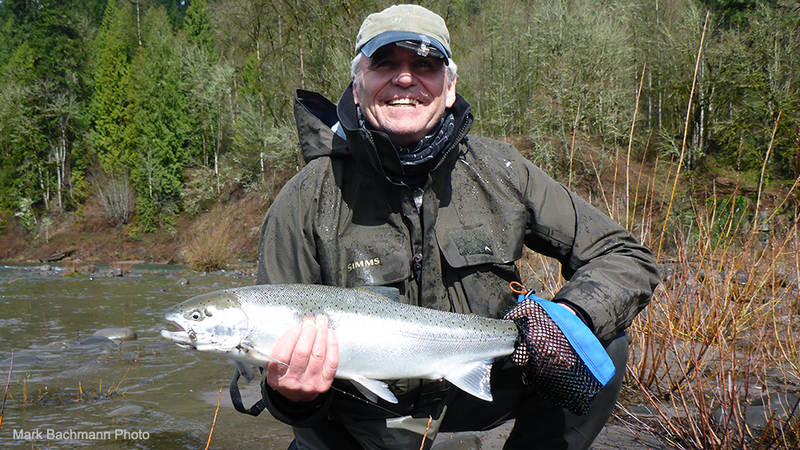 These steelhead are opportunists and remember these last marine meals when the enter fresh water. This fly is tied with shrimp-pink marabou, with gold Flashabou and orange and hot pink schlappen mixed in the front collar. 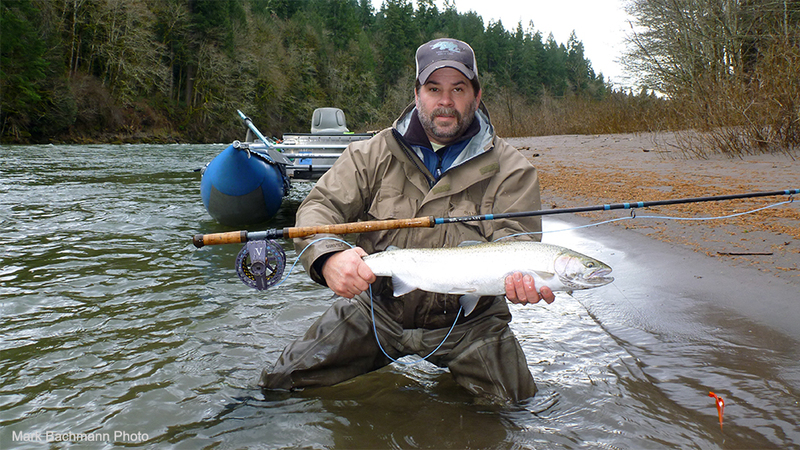 This fly is often the hottest color on many coastal rivers where steelhead are close to the Ocean. The Sandy Candy color has also proven itself in very high dirty water where it is often swung into shallow water right next to the submerged willows.